When I was young I asked Santa for a greenhouse. I secretly hoped for one in the Lord and Burnham style, the kind featured in the glossy British gardening magazines. Realistically I was willing to settle for one with polyethylene panels. I knew Santa had many lists to check off. What “Santa” brought was a custom-built cold frame, complete with a hinged glass door to allow for ventilation. I was thrilled! 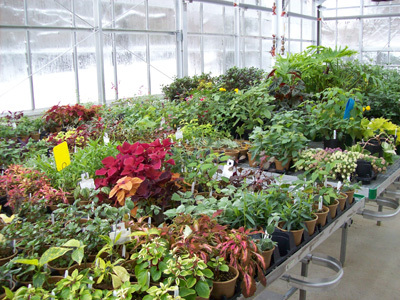 As plant enthusiasts, we often dream about a greenhouse and all the plants we can grow, display, and overwinter. 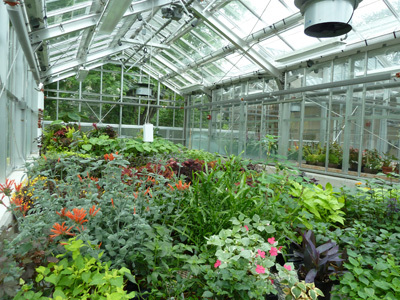 The romantic ideal eventually wanes and reality sets in: greenhouses require everyday maintenance! Perhaps the greatest challenge is managing pests. Even the cleanest and most organized facility is bound to have pest problems. Aphids are a common greenhouse pest, and have an enormous reproductive capacity, possessing the ability to reproduce asexually. Only one is required to begin an infestation. Aphids use piercing/sucking mouthparts to puncture soft and tender plant tissue to feed on sap. Infestations are often most prevalent on new growth. The soft-bodied insects often regurgitate fluid and in the process infect the plant with viral diseases. The cotton aphid, Aphis gossypii, is known to transmit more than 50 different viruses. Viruses can severely damage plants, potentially rendering an entire greenhouse crop unmarketable. Many aphids also secrete a sticky honeydew-like substance which creates additional problems. 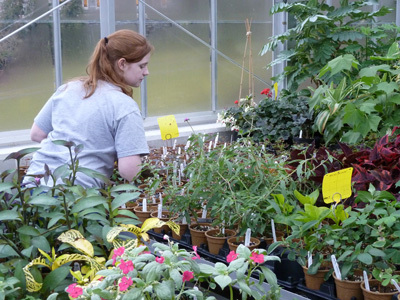 To manage pests in the Wister Greenhouse, we have chosen to use biological programs. 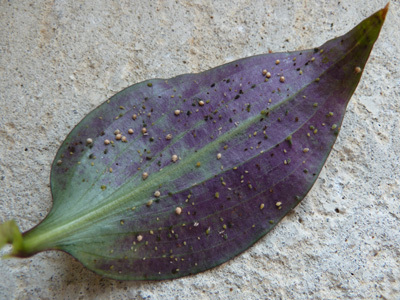 It is important to manage aphids with minimal disturbances to other biological programs. With the guidance of Biobest, a world-wide biological provider, we chose to apply and release a parasitic wasp, Aphidius colemani. A natural predator of more than 40 species of aphids, A. colemani is a small braconid wasp originating in the Near East. The wasp is small, roughly the size of a pin head, but possesses an uncanny ability to locate aphids, even when populations are low. Coupled with a rapid reproduction capability – (a single female can lay more than 300 eggs), Aphidius colemani is an ideal candidate to manage aphids when populations are first observed. 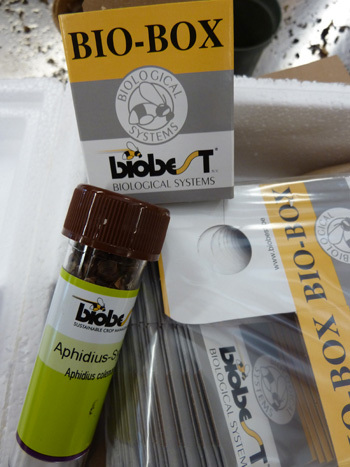 Biobest delivered a tube containing “mummies,” parasitized aphids impregnated with larva and pupae. When the tube was opened, numerous adult wasps had already emerged and immediately began flying about scouting for hosts. Mummies are scattered throughout the greenhouse ensuring even distribution. Adult female wasps deposit an egg in a host. Four larval instars, or stages of growth, occur whereupon the larva spins a cocoon inside the aphid cuticle. This causes the cuticles to swell and become a hard casing known as a mummy. An aphid can live for some time after being parasitized, but the same fatal result always occurs. 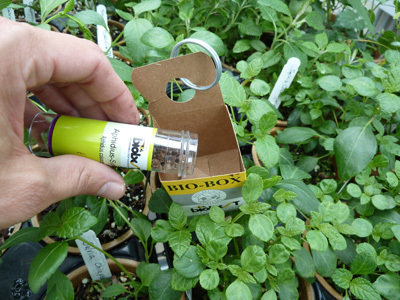 Greenhouse biological control is a relatively new science. It requires frequent scouting and observation and a bit of forethought to predict what pests may pose problems. It is for these reasons that I remained equally hopeful and skeptical regarding the Aphidius colemani program. Within days numerous new mummies were observed, a sign the wasps were proliferating. As the weeks passed and the aphid population began to decrease, the potential for the system to effectively manage pests became evident. This program is exciting and will help us further our goal to limit the use of chemical pesticides. That was fascinating! Nature is certainly complicated and inventive. Is there any concern that the wasps will escape?